The principal species of the natural order Linaceæ which includes more than fifty other species. 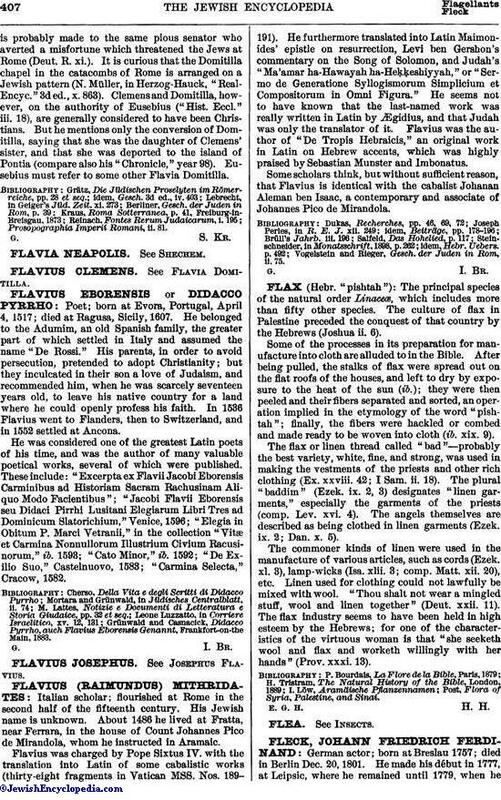 The culture of flax in Palestine preceded the conquest of that country by the Hebrews (Joshua ii. 6). Some of the processes in its preparation for manufacture into cloth are alluded to in the Bible. After being pulled, the stalks of flax were spread out on the flat roofs of the houses, and left to dry by exposure to the heat of the sun (ib. ); they were then peeled and their fibers separated and sorted, an operation implied in the etymology of the word "pishtah"; finally, the fibers were hackled or combed and made ready to be woven into cloth (ib. xix. 9). The flax or linen thread called "bad"—probably the best variety, white, fine, and strong, was used in making the vestments of the priests and other rich clothing (Ex. xxviii. 42; I Sam. ii. 18). The plural "baddim" (Ezek. ix. 2, 3) designates "linen garments," especially the garments of the priests (comp. Lev. xvi. 4). The angels themselves are described as being clothed in linen garments (Ezek. ix. 2; Dan. x. 5). The commoner kinds of linen were used in the manufacture of various articles, such as cords (Ezek. xl. 3), lamp-wicks (Isa. xlii. 3; comp. Matt. xii. 20), etc. Linen used for clothing could not lawfully be mixed with wool. "Thou shalt not wear a mingled stuff, wool and linen together" (Dent. xxii. 11). The flax industry seems to have been held in high esteem by the Hebrews; for one of the characteristics of the virtuous woman is that "she seeketh wool and flax and worketh willingly with her hands" (Prov. xxxi. 13). Post, Flora of Syria, Palestine, and Sinai.